With Mother’s Day coming up, what better way to show mum how much you care than by dishing up a home-cooked meal. 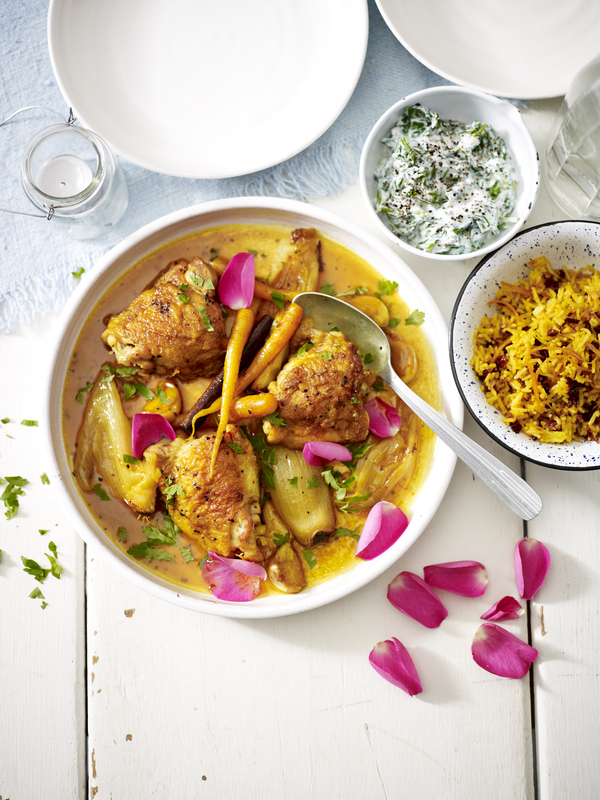 We’ve teamed up with Waitrose to give you a classic Persian dish to cook for her this Mother’s Day. 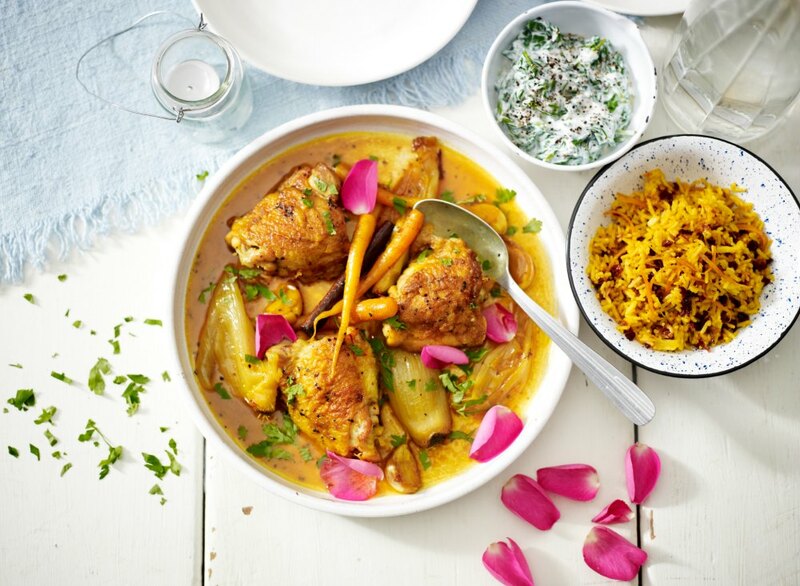 If you love this Waitrose recipe, you will love learning to cook at one of Waitrose’s three cookery schools (located in Kings Cross, Salisbury and Finchley Road). To make the saffron chicken, preheat the oven to 200°C or gas mark 6. Meanwhile, heat the oil in a flameproof casserole dish and add the seasoned chicken thighs, skin side down, and the cinnamon stick. Once the skin of the chicken is golden brown, turn the thighs over and add turmeric, saffron, shallots, crushed garlic cloves and baby carrots. Pour in chicken stock and add the juice of an orange. Bring the mixture to the boil, place a lid on top of the casserole dish and put the dish into the preheated oven to cook for 50 minutes. To make the rice, put the rice in a sieve and run it under cold water for 1 minute. Drain and place it in a small pan then fill the pan to cover the rice by an inch of water. Add the salt and a large pinch of saffron. Stir and bring the rice to the boil, cooking it for 5 minutes. Drain in a colander, rinse again under cold water then leave the rice to drain. In the same pan, melt half of the butter, using a pastry brush to coat the sides of the pan. Gently spoon the drained, part-cooked rice onto the melted butter and turn up the heat, cooking for 1 minute (steam will begin to rise). Drizzle 30ml of cold water over the rice, place a lid on top and reduce the heat to the lowest flame and leave to cook gently for 1 hour. After the hour, turn the heat high and cook for one final minute before removing from the heat and setting to one side. Heat the remainder of the butter with the sour cherries, reserved shredded orange peel and the caster sugar in a small pan. Fry the ingredients for 3 – 4 minutes on a medium heat. In a pestle and mortar grind the remaining saffron strands and pour in 50ml of boiling water. Leave the saffron to infuse for 1 minute and then pour the mixture into the cherry mixture. Bring the mixture to the boil and then remove from the heat. Pour the cherries and their syrup over the cooked rice. To make the spinach and yogurt dip, wash the baby spinach leaves in a colander and place in a medium saucepan. Wilt the spinach, drain in a colander and manually squeeze out any excess water. Combine the drained, cooked spinach, Greek yogurt and puréed garlic clove. Season with salt and pepper, and set aside in a small bowl. After 50 minutes, take the casserole from the oven and sprinkle over the parsley and rose petals. Lightly shake the pan of rice, separating the crust from the bottom and then gently tip the rice cake upside down onto a large serving plate. Spoon the chicken thigh meat, braised carrots and onions around the rice, including juices from the pan. Serve with the spinach yogurt. Fancy learning to create this from the professionals? Or want to learn to make another tasty cuisine? Check out our Waitrose cookery classes!